Gentle Cleansing foam. When I first started using this wash, it was too drying for my face. I didn't feel my face was moisturise. It lathers well in my hands but does not foam well on my face leaving it dry. After many washes, sometimes I still get the same result and I had to double cleanse with my Hada Labo to feel moisturise. Bright White Clarifying Softener. This is actually a toner. In my opinion, all toners function the same i.e. to balance skin's natural pH level, soften and removes remaining dirt on our face, to allows better absorption of moisturisers and etc. This toner takes a while to absorb leaving my face a little sticky however when it absorbs well, my skin feels softer. Rejuvenating Whitening Day Cream with SPF 20. This day moisturiser is very light and looks peachy/ creamy in colour probably due to the SPF. My dark spots and blackheads looks less visible after using this cream. 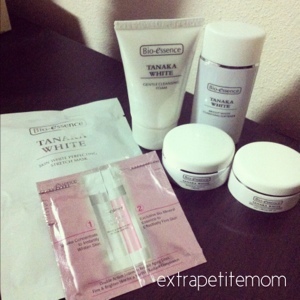 It takes a while to absorb to my skin but after, it will makes my face smooth and bright. Renewal Night Cream. This is a gel-like cream and it glides easily on my face. We LOVE this night cream the most. It smells nice too! By morning, we feel moisturised and hydrated. I hope with prolong use, it can elimates our fine lines. 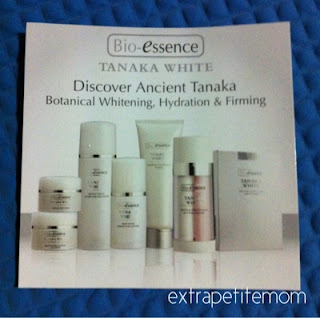 There is also a sample of White & Firm Double Essence which I have used for four times. I do not like the idea of the essence being separated. The white essence easily came out than the firm (pink) essence. But this essence made my face extra smooth and I love it! You can find Bio Essence in all Hua Ho and Guardian. Prices are slightly different from both shops though.